Fire damage at this Jerome office building was minor, but it left behind the telltale odor associated with fires. The first course of action, of course, would be to deal with the fire damage to building materials. Then neutralizing the odor would involve several steps including the use of air scrubbers like the one pictured here. After your Twin Falls property experiences damage after a storm, call our experts right away! SERVPRO of Twin Falls & Jerome Counties is ready 24/7, locally owned and operated, and Faster to Any Size Disaster. We have the experience, training, and state-of-the-art equipment to restore your home in Twin Falls to pre-damage condition. 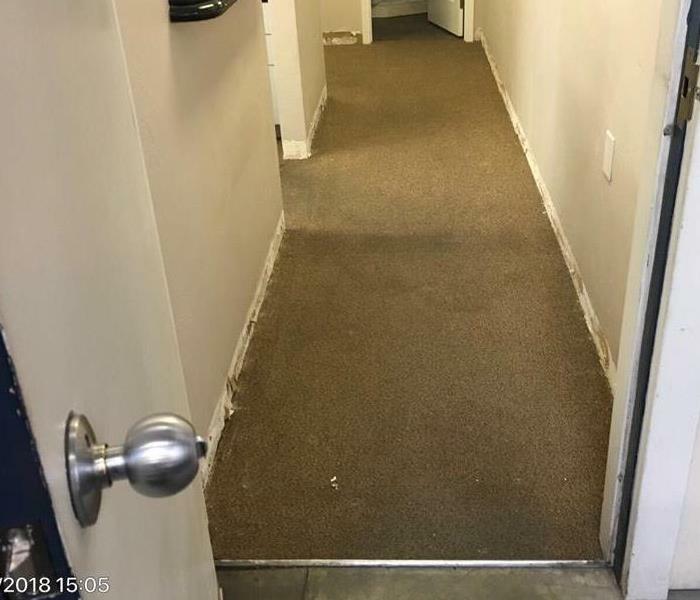 Leaks often lead to mold damage in Twin Falls buildings. 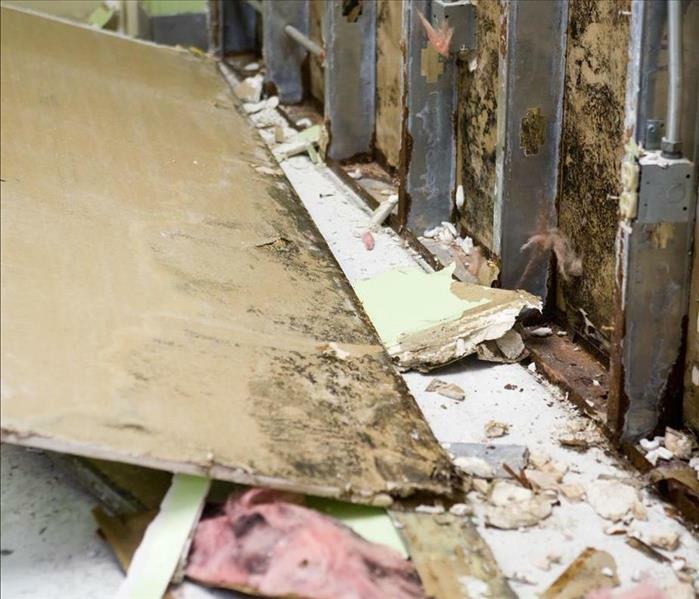 Choosing a company with the experience, training, and equipment to remedy the problem is crucial to preventing a re-eruption of mold development. That is Why to rely on a team of SERVPRO technicians, we do the job right, the first time. 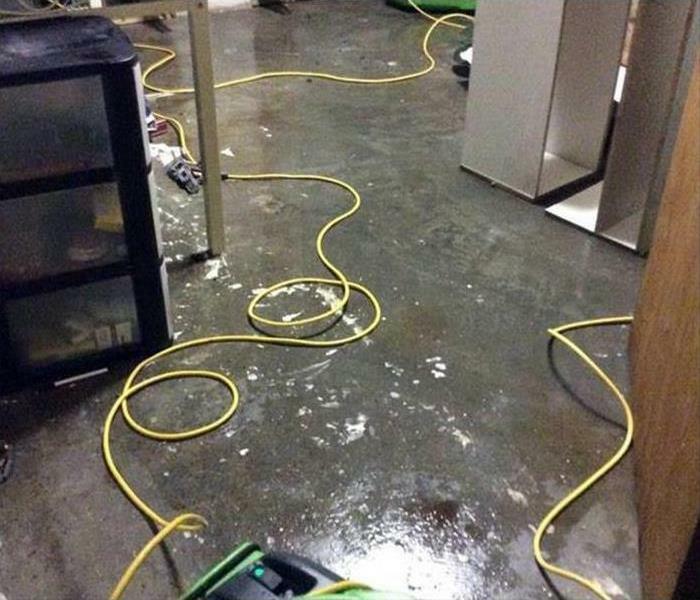 Call us after a water damage disaster has occurred on your Jerome property. Our team is highly skilled and certified by the IICRC. We are available 24/7, locally owned and operated, and Faster to Any Size Disaster! SERVPRO of Twin Falls & Jerome Counties has the equipment and water damage experience to restore your property to pre-damage condition. The water rushed into the vacant Buhl home after a sudden flash flood. 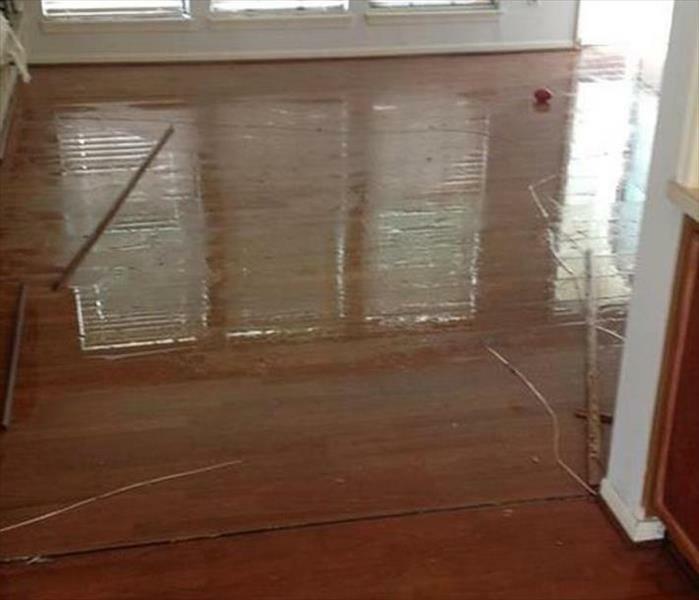 SERVPRO techs can arrive quickly to remove the standing water, dry out the hardwood flooring, and mitigate the water damages. No storm is too large for our team. When a straight-line wind rips a hole in the roof of a Buhl area structure, this mess is often the case. Unfortunately, kitchen damage is more expensive to restore and repair than a bedroom. SERVPRO teams can temporarily cover the roof damage and remove the contaminated insulation and debris. Restoring a safe environment to the affected area is a crucial first step. 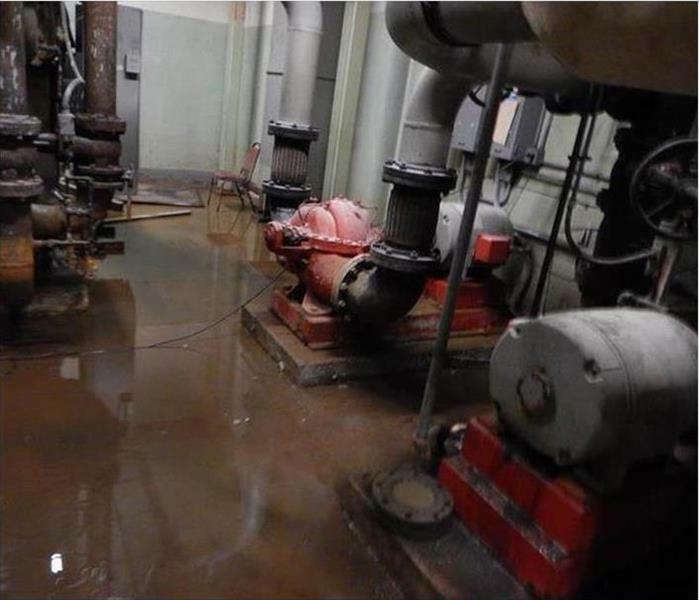 The water on the floor of this commercial structure in Twin Falls was flooded with water from a malfunctioning pump and manifold. SERVPRO can provide swift service to extract the water as the repairs are underway to mitigate the downtime and the adverse effects of the leak. Flooding carries contaminated debris which often requires a controlled demolition. 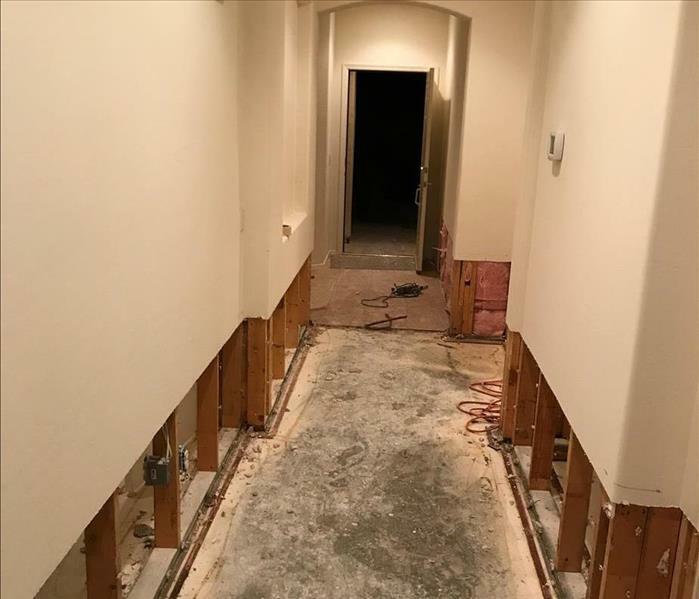 If SERVPRO is called out to a Jerome area home, we can extract the standing water, and remove the damaged drywall at the 2-foot level. This decreases the time and money spent on reinstallation once the structure has been dried. 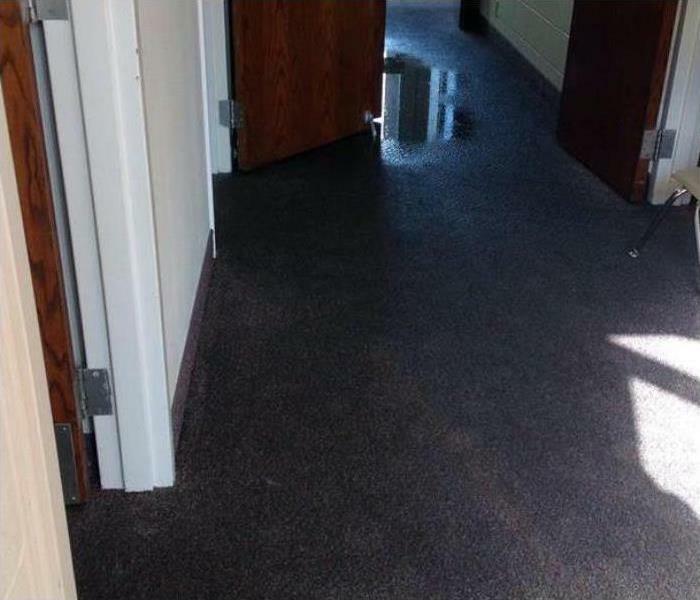 This photo shows the affected area in this Jerome office hallway after drying. You can see the vinyl baseboards have not been replaced yet by our SERVPRO team. They were removed to facilitate drying by letting moisture that had wicked into the walls to escape with the help of the now removed air movers and a dehumidifier. 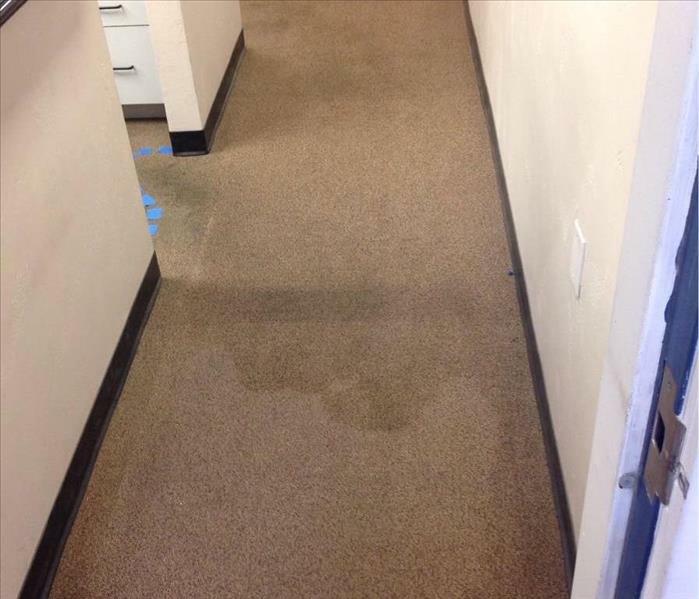 In this Photo, you can see the water that soaked into the commercial grade carpeting at the Jerome office. Our SERVPRO technician indicated where the water stop advancing with the blue painter's tape. Our assessment is complete, time to extract the water and salvage the flooring and walls. Count on us. Home fire in Burley, ID. 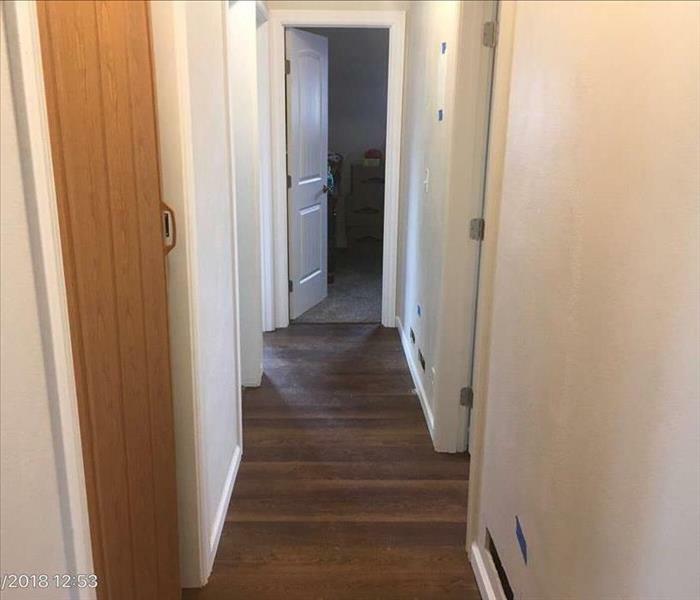 Here is the same affected hallway from the fire in Burley after we had completed reconstruction. We were thankful to be able to help this family and help the home look "Like it never even happened." 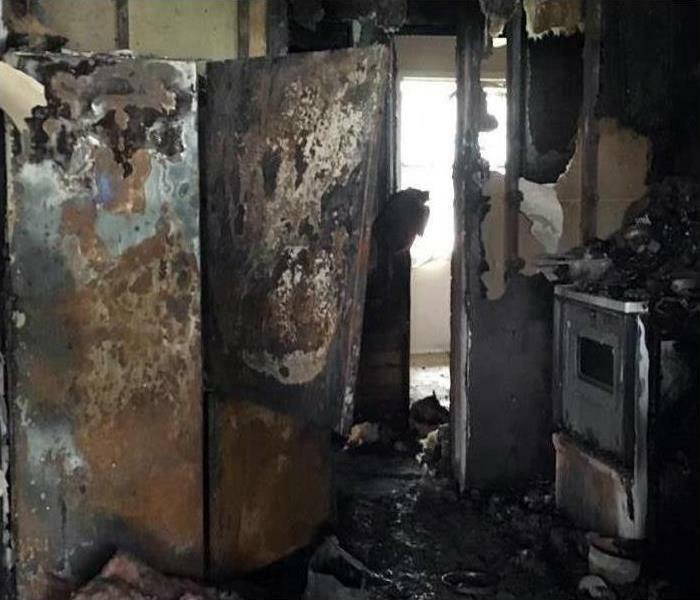 This devastating fire ripped it's way through this beautiful family home. You can see significant char, smoke and water damage to the hallway. Even with all the damage we were able to respond quickly and begin repairs. Luke and David got to hang out at Canyon Springs Golf Course in Twin Falls, ID for the Western Magic Valley Realtors Association Annual Golf Scramble. Many real estate offices rely on our SERVPRO expertise for preparing homes for sale. Our crew just arrived in a van from our SERVPRO Green Fleet. This minor water damage in Twin Falls, ID home was soon taken care of with courtesy and professionalism. We proudly serve our neighboring communities with the best possible service. When the Big Wood River began to hit flood stage, SERVPRO of Twin Falls and Jerome Counties were there to lend a helping hand. Our team donated their time for the better part of a week filling, delivering, and placing sandbags to save homes throughout Blaine County from the fast rising water. This is a copy of the Certificate of Satisfaction we received when we were finished with the project. Incase you can't read it the comment says "David and Luke were awesome. 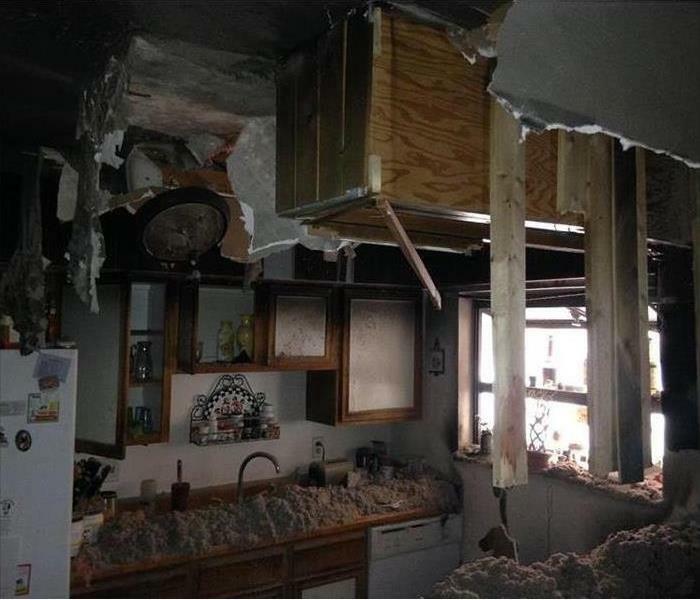 SERVPRO knew and followed all the Insurance guidelines. 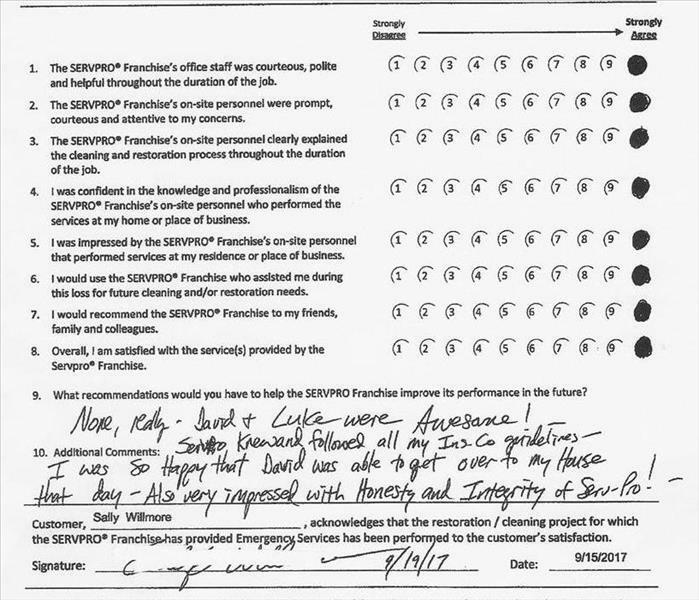 She was impressed with the quality of serve she received and was impress with the Honesty and Integrity of SERVPRO. At one of our vender's customer appreciation dinner and speed racing at the local race track. 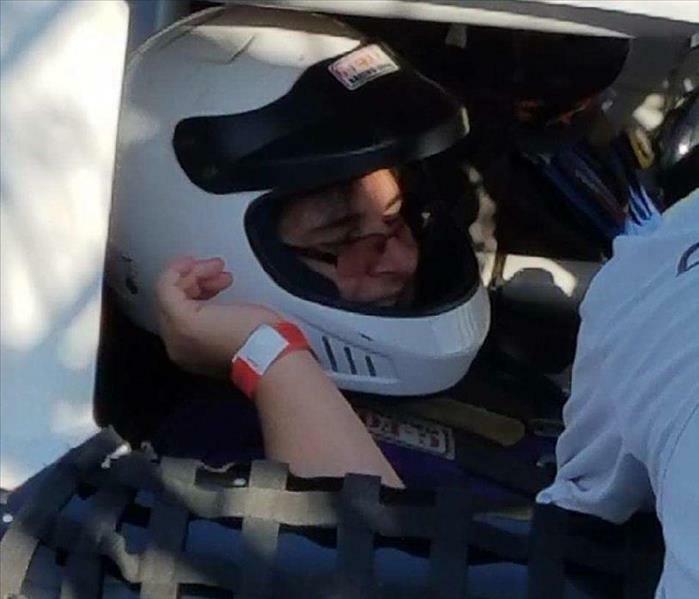 Our office administrator, Patricia, was able to go on a ride-along reaching speed up to 150 miles per hour. Since Patricia is the one that deals with this vendor, she went to represent SERVPRO of Twin Falls. 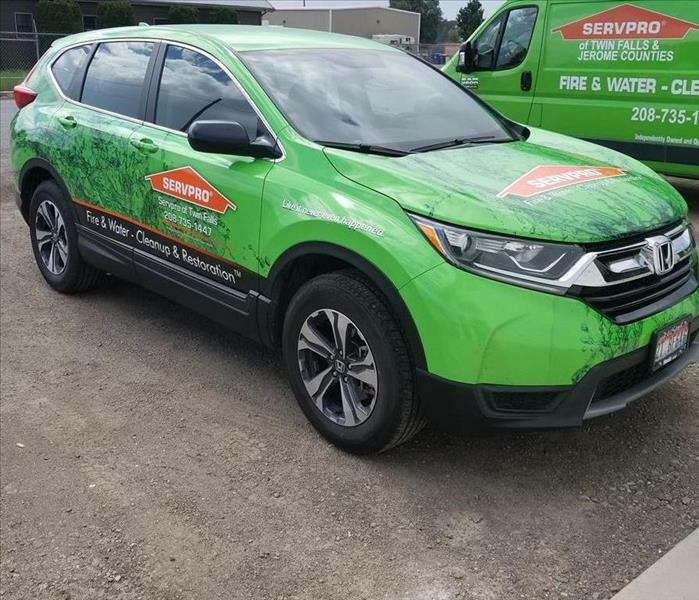 While our marketing/Sale Manager is out visiting with insurance adjusters and agents he will be seen driving around in this slick little CR-V.
We want to let people know who we are and you can count on us. 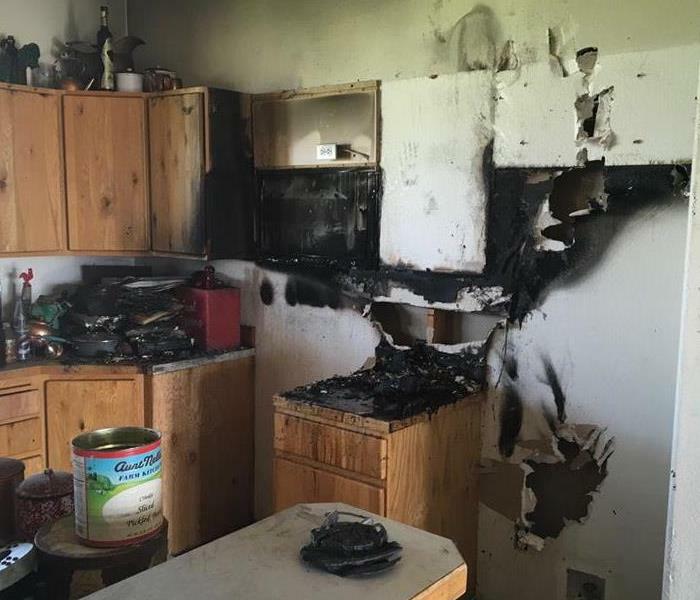 This was the aftermath of a Kitchen fire in Castleford, Idaho. 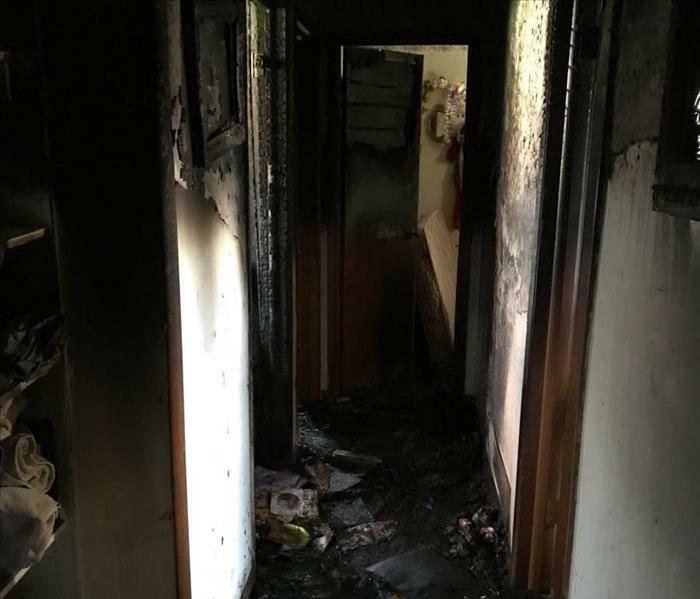 As you can see there was a significant amount of Smoke and soot damage to the kitchen and there was smoke damage throughout the entire home. SERVPRO of Twin Falls/Jerome Co. was there to clean up the aftermath. The cleanup was done in a timely manner so the repairs can be done. SERVPRO of Twin Falls believes in a restore vs replace mentality. 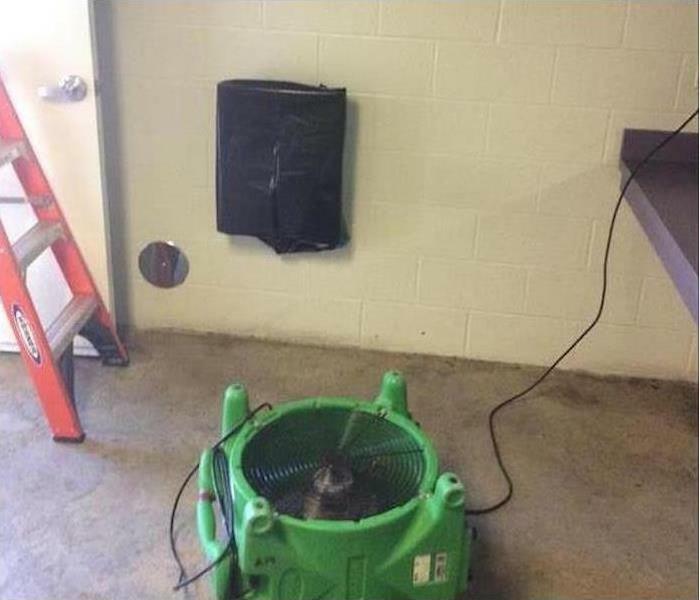 We use all available approaches to restoring your home in water damage situations. Our goal is to dry your structure "in place" and leave as minimal of a footprint as possible! SERVPRO of Twin Falls is dedicated to respond to your emergency need with the most advanced technology available. With our Inject-Dri Floor drying system, we are able to restore water damage to hardwood floors and make it "Like it never even happened." SERVPRO of Twin Falls is committed to responding to any emergency faster than anyone else! We're Faster To Any Size Disaster. Believe our tagline, it is for real! We want you to know who we are when we arrive! 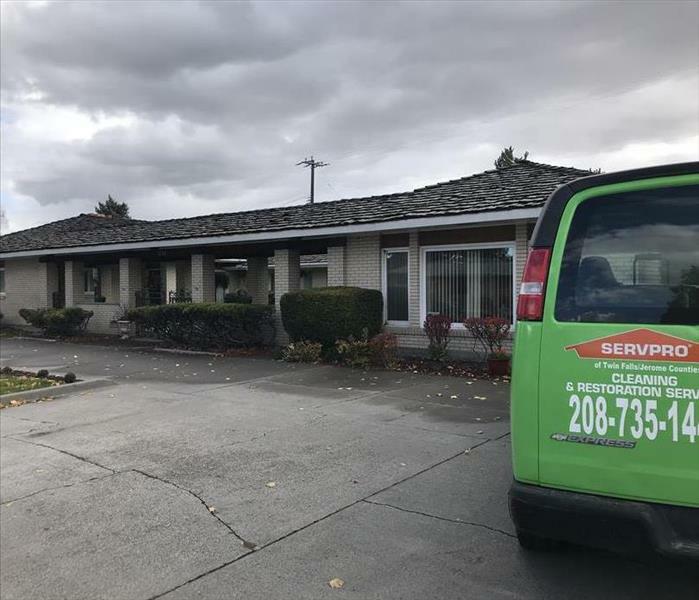 SERVPRO of Twin Falls has expanded our Green Fleet! We have expanded our Green Fleet so that we can respond more quickly to your restoration emergency. We're Faster To Any Size Disaster. We answer the call 24/7/365 to your fire, water, and mold damage cleanup and restoration needs.